I think it is time to short US T-Bonds. I'm going to give you the fundamental reason and show what the market itself is doing. I'm basing this thesis on the theory that when interest rates go up bonds fall. Maybe it really is that simple. The tricky part has been figuring out when the FED will start tinkering with rates. I think they might do it this year. I don't see anything in the latest BLS employment report to make me think otherwise. You could say headline unemployment of 5% is to high to the FED. Of course the real unemployment rate is higher because they bake the numbers these days. But still real, unreal, semi-real unemployment rates are falling. I say 3% unemployment is unrealistic given the situation we have been in the last 8 years. I think anybody who is intelligent realizes the old days of conceptual thinking about target unemployment rates aren't possible now. Yeah, we could have 3% unemployment in a bubble economy. Let's just get 40% of the economy devoted to financial services(engineering) and see what happens! Any way you look at it unemployment is falling. Maybe I'm smoking dope on this report but this says wages are rising. In May, average hourly earnings for all employees on private nonfarm payrolls rose by 8 cents to $24.96. Over the year, average hourly earnings have risen by 2.3 percent. Average hourly earnings of private- sector production and nonsupervisory employees rose by 6 cents to $20.97 in May. For the next exhibit we have job openings. There are more job openings out there than there have been in fifteen years. 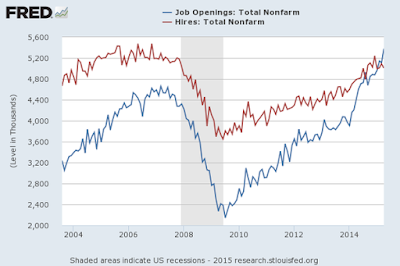 There were over 5 million job openings in April. Let's think about the gravity of the FED raising rates. Will a slight rise really matter that much? I think the banks can handle it. They will still be in a situation to prosper. Finally, I believe the market itself is saying the top is in for bonds. 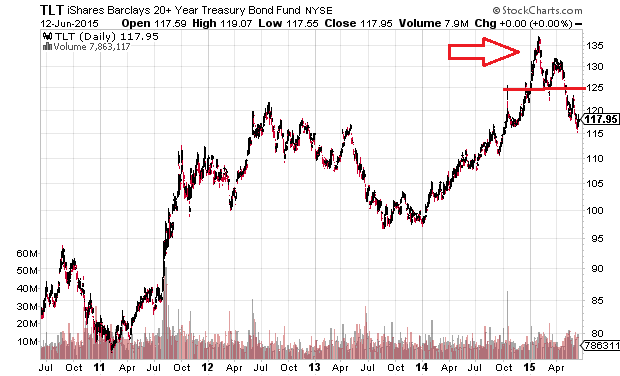 Below is a five year chart of TLT 20 Year Bonds. The red arrow points to the spike top. A spike top or bottom is one of the strongest reversal chart signals. The top was tested in March and April. It was confirmed in May. 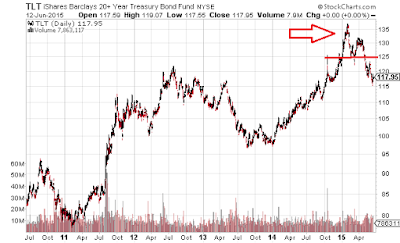 The drop for bonds continued and we are in free-fall now. The stock TBT is a vehicle to short TLT. So the way I want to short is with TBT Proshares Ultrashort Treasuries. Any spike upward on TLT is opportunity to get longer TBT.